Bruschetta is one of those fabulous appetizers that work quite well both at family dinners and fun parties. While you think of traditional bruschetta recipes as being tomato-based, other tasty variations exist. Here is a collection to keep your friends and family satisfied while mixing up the niblets to keep it fresh and exciting. One of my favorites is ours right here on Midwestern Moms. This really easy recipe uses fresh figs and creamy goat cheese for a light and sweet snack that’s perfect for weekends. Another light and sweet bruschetta variation comes from The Wicked Noodle. This uses grilled peach slices, easy homemade lemon ricotta cheese, sliced toasted almonds, and drizzled with honey. Sprinkle a little black pepper on top if desired. Goat cheese is also perfect with peaches, so why not try the Peach and Goat Cheese Bruschetta from She Wears Many Hats? Or Strawberry and Goat Cheese Bruschetta from Homemade Hooplah? Want to sneak in some more veggies? Peas and Crayons tried pureeing organic peas to make a yummy spread for putting on her Spring Pea Crostini With Tomato and Avocado. You can’t go wrong adding avocado to anything! Fearless Dining brings a little heat and flavor with Spicy Shrimp and Roasted Pepper Cheese Crostini. It’s great for summers because you can cook the shrimp and corn on the grill. This version is even gluten-free! Speaking of grilling, Sidewalk Shoes likes to grill bread with Harissa paste, which is a Moroccan Chili Paste. It’s topped with slices of fresh heirloom tomatoes and green olives mixed with chopped pine nuts, herbs, and spices. Thrifty Jinxy has a fresh and healthy Tuna Bruschetta recipe. Take your traditional bruschetta combination, and put it on top of a simple tuna salad served on pita instead of bread. 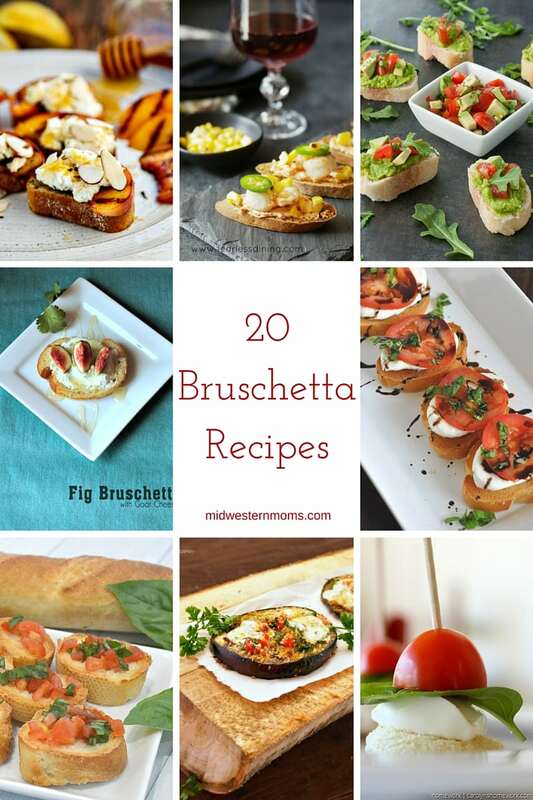 In the mood for a more traditional bruschetta recipe? Organized 31 has a super easy way to make it in time for lunch as the perfect complement to a salad. Traditional bruschetta is still fabulous, but there are other ways you can make it unique. My Turn for Us uses three cubed cheeses, Asiago, Mozzarella, and fresh Parmesan to really build up the cheesy flavor. You can also mix up traditional bruschetta by serving it on roasted eggplant. Oh So Savvy Mom shows you how, and you can make it gluten free by eliminating the bread crumbs she recommends. Three Different Directions strips it way down by mixing chopped tomatoes with garlic and finely chopped basil. What could be easier? Know someone who isn’t a huge fan of all the tomatoes? Happy Deal Happy Day substitutes roasted red pepper for the tomatoes. Have you ever been to Spaghetti Warehouse? Their Stuffed Bruschetta is inspired by caprese salad and CopyKat shares the recipe. Of course it includes fresh mozzarella, fresh basil, and Roma tomatoes. Top it off with a balsamic vinegar reduction. Carolyn’s Home Work takes this caprese salad inspiration a step further and uses grape tomatoes while stabbing them to create Caprese Salad Crostini Skewers. Turn bruschetta into a main course! If you’re trying to maintain a healthier lifestyle, Divas Run for Bling has a Clean Eating Bruschetta Quinoa Bake. It keeps your favorite tradition alive while cooking it over quinoa. Another great main course is when you top baked chicken with bruschetta. My Turn for Us uses Gouda cheese in the bruschetta for a different flavor. It’s also a great way to enjoy the taste without all of the carbs from the bread. You can also make a Bruschetta Pasta Salad to serve as a meal or a side dish. A Pretty Life in the Suburbs uses homegrown tomatoes and basil mixed with garlic and onions and Parmesan cheese to toss with favorite pasta. If you don’t want to use bread for your bruschetta, top off a bowl of hummus with this bruschetta recipe from Peas and Crayons, and then serve it with favorite vegetables and pita bread. For a fun twist, let your guests design their own favorite combinations at your next party. Julie Is Coco and Cocoa shows us how to set up a station where friends can add their own favorite toppings to their toasted French baguette. Her suggestions include the fresh basil leaves and cherry tomatoes you would expect, plus a choice of salami, pancetta, and prosciutto with French onion dip. You can also include some of your own favorites from our collection! Which of these Bruschetta Recipes is your favorite?